This post is a number of weeks overdue. But, as they say, better late than never, right? 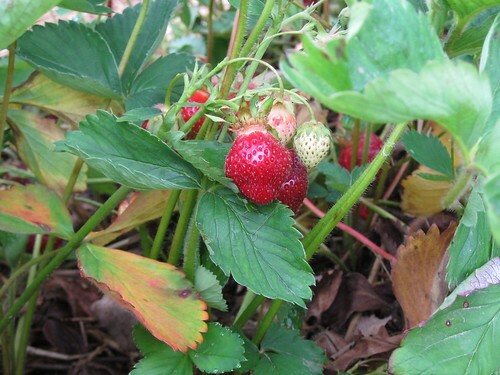 It's been a pretty wet summer here so far - not the very best weather for strawberries, but despite the sogginess, the berries were excellent - fresh, juicy yet firm, sweet and flavorful. They also looked like jewels. We brought the only buckets we own - these adorable painted buckets that my mom and I got for Will - one features scenes from Curious George and the other has drawings from Dr. Seuss books. It turns out that Will could care less about these charming buckets (anything that does not have wheels and a motor just does not make the cut for him these days), but I think they're pretty darn cute. 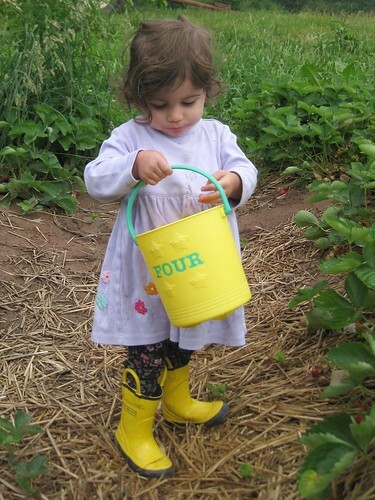 Anyways, we filled them both and happily paid about $10 for our berry booty before hurrying home to make nap time. 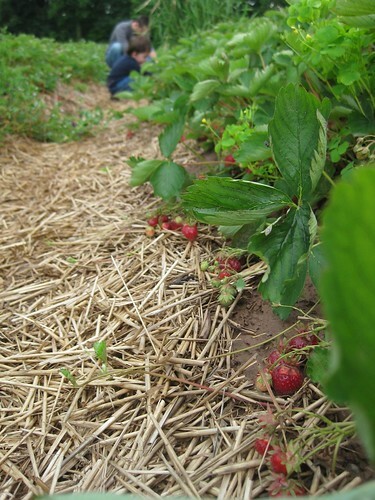 Once Will had gone to sleep, we quickly washed and dried most of our berries and froze them to help see us through the looooong winter. 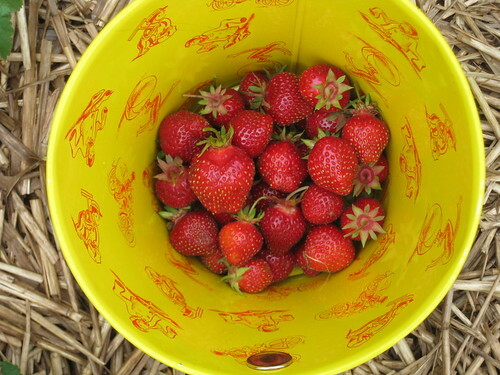 The rest was easy - slice the berries, toss them with some lemon juice and a little sugar and let them macerate a bit. Then serve with whipped cream, ice cream or a non-dairy alternative like Purely Decadent or Coconut Bliss - they're made with coconut milk and very tasty - definitely beat the pants off Rice Dream or any soy-based ice cream alternatives. 1. Rinse and hull the berries, then slice into a large bowl. Add 1/4 cup sugar and and 2 Tbsps lemon juice and mix into the strawberries. Set aside at room temperature to macerate (aka soften). 2. Make the biscuits. Sift the flour, sugar, baking powder, and salt into a large bowl. Toss with a fork to combine. Cut the butter into the flour mixture with a pastry cutter or a fork until the largest pieces of butter are the size of peas. (Or pulse several times in a food processor.) Combine the cream and vanilla. Make a well in the center of the flour and and pour the cream mixture into the well. Mix with a fork until the dough is evenly moistened and just combined; it should look shaggy and still feel a little dry. Gently knead by hand five or six times to create a loose ball. 3. Turn the dough out onto a lightly floured work surface and pat it into an 8-inch square, 3/4 to 1 inch thick. Transfer the dough to a baking sheet lined with parchment or silpat, cover with plastic and chill for 20 minutes in the refrigerator. Heat the oven to 425ºF. Remove the dough from refrigerator. Cut the dough into 8 even squares and spread them about 2 inches apart from each other on the baking sheet. 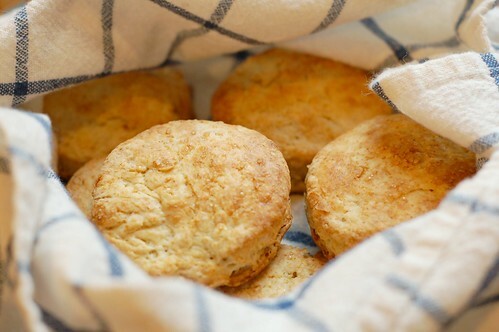 Bake until the biscuits are medium golden brown, 18 to 20 minutes. 4. 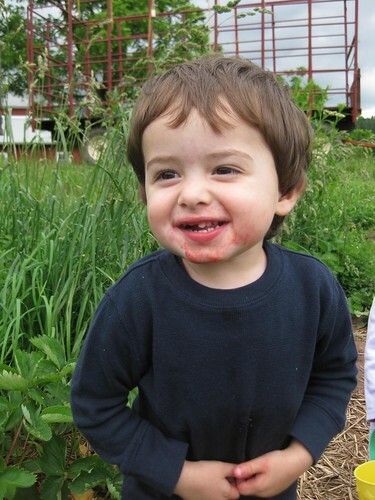 Meanwhile, take a potato masher and smash the strawberries just a little to get more juice out of them. If you're using whipped cream, whip the cream, adding a drop or two of vanilla and a teaspoon of sugar. 5. 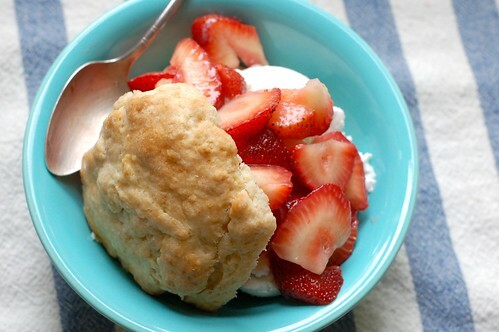 Cut each biscuit in half, top with strawberries and serve with a generous dollop of either whipped cream or ice cream. god! 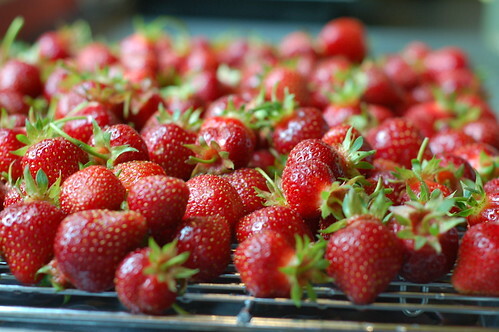 i love how fresh, happy strawberries look! So precious and fragile and rich and delectable. 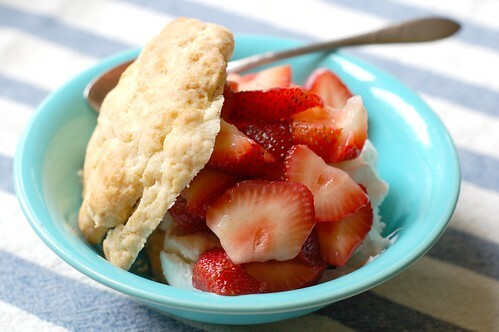 strawb shortcake is the bee's knees. Uh oh, I need this real bad. I believe it is not possible to divide a square into 8 equal squares so just did 9!